A source close to Ivanka Trump told E! 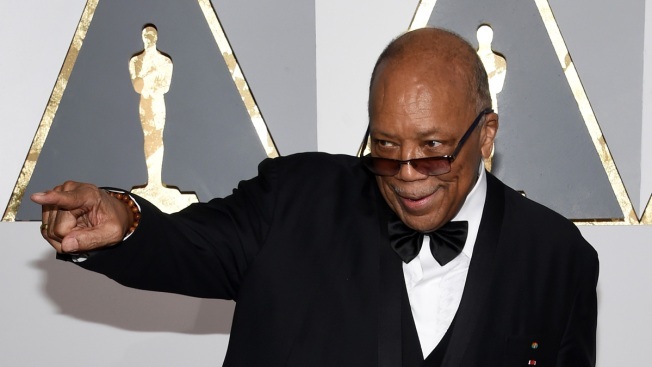 News, "This story is not true"
In this February 28, 2016, file photo, record producer Quincy Jones attends the 88th Annual Academy Awards at Hollywood & Highland Center in Hollywood, California. Quincy Jones claims to have some history with the first family. The 84-year-old record producer sat down for an interview with Vulture in which he opened up about some of his personal relationships, including one he says he had with Ivanka Trump. "I used to date Ivanka, you know," he said. "12 years ago. Tommy Hilfiger, who was working with my daughter Kidada, said, 'Ivanka wants to have dinner with you.' I said, 'No problem. She's a fine motherf-----.' She had the most beautiful legs I ever saw in my life. Wrong father, though." Jones only mentioned one date, and Ivanka has never spoken of it publicly. E! News reached out to her team for further comment. A source close to Trump also told E! News, "This story is not true." Jones also discussed a few of his other close relationships, including that with Michael Jackson. He worked with Jackson more than any other person outside of his famous family. However, Jones doesn't have the most positive things to say about the late King of Pop. "I hate to get into this publicly, but Michael stole a lot of stuff. He stole a lot of songs," Jones alleged. "[Donna Summer's] 'State of Independence' and 'Billie Jean.' The notes don't lie, man. He was as Machiavellian as they come." How? Jones continued, "[He was] greedy, man. Greedy. 'Don't Stop 'Til You Get Enough' -- Greg Phillinganes wrote the C section. Michael should've given him ten-percent of the song. Wouldn't do it." Jones also claims he advised against Jackson's plastic surgeries. "I used to kill him about the plastic surgery, man," Jones said. "He'd always justify it and say it was because of some disease he had. Bulls---." But Michael Jackson is not the only musical icon Jones criticized. He also thinks The Beatles were the "worst musicians in the world." "Paul [McCartney] was the worst bass player I ever heard. And Ringo [Starr]? Don't even talk about it," Jones said. Jones did list current artists who he admires as musicians and enjoys their work. "Bruno Mars. Chance the Rapper. Kendrick Lamar," he says. "I like where Kendrick's mind is. He's grounded. Chance, too. And the Ed Sheeran record is great. Sam Smith -- he's so open about being gay. I love it. Mark Ronson is someone who knows how to produce." You can read his lengthy interview with Vulture here.